Unique, mountainous,2.7 acre horse property. Private lot surrounded by mature pine trees providing seclusion. Professionally landscaped elegant yard w/beautiful perennial flowers. 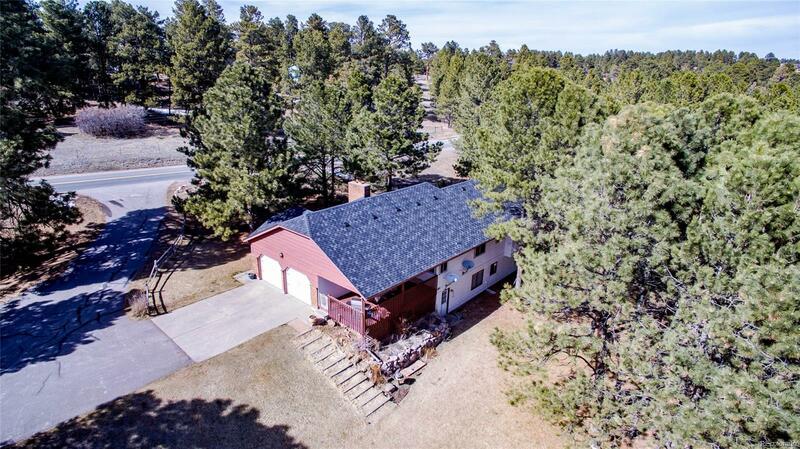 Enjoy quiet evenings on large covered deck overlooking peaceful lot w/Pikes Peak views & warm sunsets year round! Covered horse corrals past pine trees open to acre fenced-in pasture for livestock! Home has been meticulously maintained by 2nd owner. Rare walkout basement ranch w/2 fireplaces, 6 beds, 3 baths,3 walk-in closets. Brand new appliances, newer Brazilian Koa solid wood floors, remodeled bathrooms w/marble tile,new paint,windows,hail resistant roof! Solid bones. Master suite surrounded by pine trees & overlooks park-like grass area. Basement beds w/garden level windows w tons natural light w/scenic views wooded land. Private well= 0 water bill! Huge asphalt driveway makes for easy, mud-less winters. Leveled RV parking space w/trimmed trees Plenty of space to add out buildings with NO HOA!